After a decade of triathlon, 21 ironmans and many more shorter tris, the whole swim/bike/run thing is not very new or exciting for me any more. One of my favorite greetings whenever I see a friend is to ask them "soooo, what's new and exciting?" Sooooo I asked myself the same question and came to the conclusion I needed to inject a gigantic dose of "new and exciting" into my own life. Enter Operation T-NET: Try New & Exciting Things! I couldn't decide between the red or white. In the end I went with the white...because the tie-up laces felt nicer and snugglier than the elastic laces (silly enough after the whole triathlon E-Z laces thingy). Also Zeke told me that I can just throw them in the washing machine (but air dry) if they get dirty or stinky...so I felt all right going with the white pair! Obviously (or maybe not obviously), I'm not planning to actually RUN in these. I just wanted some because they look cool, in a creepy Ninja Turtle kinda way, and I like the idea that they will strengthen the instrinsic muscles in my feet. 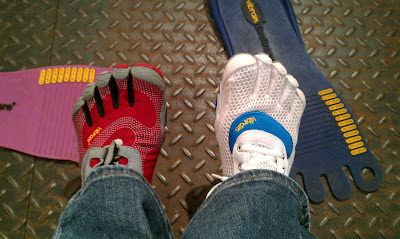 Walking has gotten boring (since that's one of the activities I can do now) so I thought I'd throw in the barefoot element to it, and hit the trails. 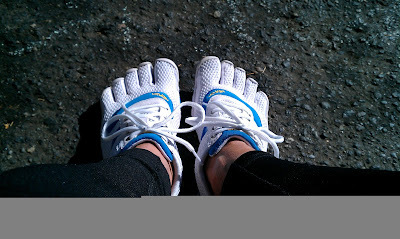 I also plan to do other new & exciting things while wearing my new ninja toe shoes! Stay tuned for the next phase of Operation T-NET!